Pest rats in Fife, Perth and Kinross can be a real problem for householders and businesses alike, so our rat control services are much in demand throughout these areas of Central Scotland. At Active Pest Solutions, we have 15 years of experience and understanding of rat behaviour and are equipped with the knowledge, skills and equipment to practise effective rat pest control in a wide variety of situations including houses, factories, farms, stables, chicken runs, shops, hotels, restaurants, halls, churches, sheds, garages etc. Our specialist rat control operatives will safely and effectively eradicate your rat problems by adopting Health and Safety approved trapping and baiting systems – while keeping you, your business, your family, your pets and the environment protected. As members of the Fife Trusted Trader Scheme and Perth and Kinross Better Business Partnership, our working practices, pest control qualifications, customer service and integrity have been checked and approved by Trading Standards officials, so you know we’ll deliver rat control you can trust. The most common type of rat in the UK is the Brown or Norwegian rat. Originally from Asia, these pesky rodents were first recorded in Britain in the 18th Century, having entered the country via ships from Norway. They are greyish brown in colour and up to 270 mm long plus tail (10.5 inches). A female Norwegian Rat can have up to 6 litters of young in a year, with between 6 and 11 “pups” in a litter. This has the potential to lead to a lot of rats, as the young become sexually mature between two and three months old. Rats are rodents, with the word rodent deriving from the Latin word “rodere” – which means “to gnaw”. A rat’s teeth continually grow, requiring it to gnaw on anything available in order to shorten them to a usable length. This process can result in damage to water pipes, electric cables and wiring as well as damage to other fixtures and fittings. In a business situation your stock and machinery, not to mention your good reputation, can be at stake. For this reason, rat control in restaurants and food production companies forms a regular part of our daily routine, in addition to our pest control operations in domestic and non-food business situations. Rats in the UK can carry and transmit many dangerous diseases including Weil’s disease, spillary fever (rat bite fever), Hantavirus, listeria and salmonella. All these diseases can cause serious illness and can sometimes even prove to be fatal. We have pest control service contracts at many food production plants, restaurants, takeaways, shops and hotels in the Perth, Kinross and Fife areas – with the emphasis on total pest prevention including rat control. So to protect your business or home from pest rats, contact Active Pest Solutions. Rats will use cavities and gaps in walls and floors, or pipe and cable openings, to negotiate their way from one part of a house or structure to another part. They will also gnaw their way through skirting boards, doors, pipes, electrical wiring and cables etc., causing damage and distress as they go. The wily rodents will always attempt to live near a good food and water supply, so it’s also worth monitoring for rat infestations around compost heaps and under sheds. Left untreated, a small rat problem can rapidly escalate into a crisis. So the moment you suspect that you require rat control, either call for expert help on 01577 862035 or email us information about your rat problems. Our customers are to be found in many towns in Fife. For example, a customer needed our pest control expertise in Leven when scurrying was heard in the attic of her home and rat droppings (which are usually dark oval shapes, 10–15mm long) were spotted under the kitchen sink. Active Pest Solutions were also asked to provide rat control in Glenrothes when rats entered a chicken run and helped themselves to both poultry feed and eggs. 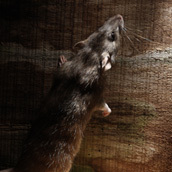 In addition, we regularly provide rat pest control in Kinross-shire gardens, houses, hen houses and stables etc. to keep rat populations under control. We received a call-out to control rats in Dunfermline after the greedy rodents found a welcome supply of food at bird feeder, dug themselves a burrow and promptly set up home in nearby bushes. Another rat control situation that we encountered in Dunfermline occurred when rats got into a car and damaged electrical wiring and seat upholstery. We are often asked to provide rat control in Kirkcaldy gardens, with rats living under the garden shed being a common distress call. We’ve also implemented rat control measures in Dalgety Bay, where we removed a rat from a top floor flat. In addition to solving domestic rat problems, Active Pest solutions provide contract rat control In Fife, Perth and Kinross-shire for a wide range of commercial and community-based clients including factories, farms, shops , hotels and halls and meeting places. Would you know how to spot a rat? Smear marks – dark, oily marks left by rats on walls or at gaps, etc. If you have a rat problem at your home, office, farm or commercial premises, call Active Pest Solutions on 01577 862035 during office hours for fast, safe, effective and professional rat control from a Trusted Trader.